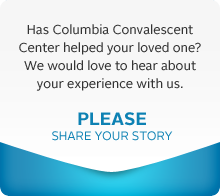 My husband, John has been a resident at Columbia Convalescent Center since March 12, 2007. He continues to receive the care he needs, and I receive the support that I need. The entire staff, including Administrative, Nurses, CNA's, Activities, Therapy, Laundry, Dietary, Housekeeping and Maintenance, are all very helpful, friendly and supportive. Our family would like to express our deep appreciation for the outstanding care and love shown to Carol during her recent stay at Columbia Convalescent Center. You have a very dedicated and professional staff at all levels. A special thanks goes to Donna and Wendy, her primary nurses, and to Jessica, her can, for their loving care. During Carol's last few days, your management and staff went out of their way to accommodate our family in ways that are too numerous to mention here. The kindness we were shown will be remembered for a lifetime. Please do not hesitate to use our family as a reference to other families seeking the best care for their loved ones. Know that the work you do is truly a gift to everyone you touch. I appreciate all of the things everyone did for my uncle. I didn't have to worry about him when he was there. How do you begin to thank all of the wonderful people who touched my Mom's life? All the thank-you's in the world wouldn't be enough. I know my Mom also touched a lot of people's lives. She was a sweet and lovable person. She loved to say hi to everyone. Everyone at Columbia Convalescent was extremely nice and caring. I know my Mom received such wonderful, loving care from everyone. I won't mention names because I don't want to leave anyone out. There were so many wonderful people taking care of her during the past 12-1/2 years. God will reward them all. I am so thankful she found a home with Columbia Convalescent. Even though Alzheimer robbed her of all her faculties, no one made fun of her, no one was mean to her. I know it is difficult to take care of a person who has no control over their body, but she was taken care of in a loving, gentle way. Alzheimer stripped her of everything. I firmly believe a part of her still recognized me. She could do her special talk and show some signs of recognition. In the hours preceding her death, so much love and care was expressed to our family from everyone at your center. I can't express how much that meant to us. Everyone was terrific. Like I said, how do you begin to thank everyone. I thank you all from the bottom of my heart. Please extend these thanks to everyone. I would recommend your home to anyone who asked me for a good nursing home reference.